Chapter 9 Barrels Out Of Bond is full of grumbling, snoring, slapstick bumbling about, and sneezing – here are the thirty nine culprits which form that little peak: trotting clang bumped clank clink snored trotting bumped grunted racket thumped grumbling grumbling snoring bumping grumbled grumbled bump ho plump splash bump smacking thudding splash spluttering bumping creak bump dripping drippings sneezes snivel racket sneeze sneeze sneezed creaked grumbled. Early on I entertained the idea that poetry was an indicator of high register. Ahem. One rousing chorus of [01.064] “Chip the glasses and crack the plates!” soon cured me of that, although I maintain that once Thorin declares himself, the register of the poetry rises, even including the reprise of Tra-la-la-lally. I thought, “How can I measure poetical words within the prose?” It’s too easy to cherry-pick one’s examples without a strict criterion, so I thought of onomatopoeia – poetry words that could be identified objectively. Lucky for us, the OED marks words that are onomatopoetic – including echoic and imitative words – so I let those awesome editors make the human-yet-objective identifications for me. Sound-play words became my measurement of poesy, and I abandoned all pretense of calling these words “high” register immediately, and of marking them either “low” or “high” very shortly after that. In the end, it’s Chapter 5 which uses sound play words like the instruments of the London Symphony Orchestra. After all, the chapter is not titled “Riddles in the Well Lit Parlour with Plenty of Visual Images”. The exciting news for us is that we can measure exactly what Tolkien changed between his two editions of Chapter 5, and we know exactly why he made those changes. We’ve proven that the new paragraphs were full of uncommon words, we’ve proven that those new paragraphs were full of sound words. I believe we can conclude positively that the sounds of stagnant water and deep-throated swallowing and Gollum words and a preponderance of initial-S words are Tolkien’s specific instruments for creating the tone of decay and corruption which emanates from The Ring. I would be excited to carry this idea forward to examine the ring-influenced portions of The Lord of the Rings. So what? So we have a tool – a robust and valid tool – for seeking the influence of the Ring, of corruption, of evil in Tolkien’s work at a subtler level. It’s right there, encoded in the sounds of the words, waiting for us to discover. footnote: alert Word Fans who hang on every graph will realize that this is a new version of the Sound graph made since the decision to count the names Gollum and Roäc and Carc as sound play words. The scale goes up to 0.03 now to contain that Chapter 5 peak and even the Chapter 9 peak looks rather puny in comparison. 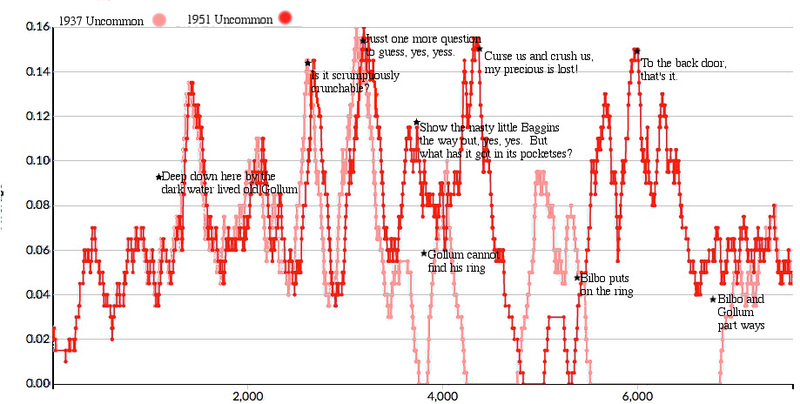 For comparison, the overall uncommon words graph scale reaches to 0.070. See the posts tagged 1937 to see with smaller windows even stronger influence of sound on Chapter 5. 1937 & 1951: What does the change in diction reveal? Why does Tolkien use sound words more densely in the new 1951 paragraphs of Chapter 5 than in the earlier edition? As Corey Olsen says (2015), the caverns and tunnels are just as dark in 1937. In this project, we focus on register: what change in register did Tolkien achieve in his later edition? Gollum in 1951 is based on Gollum of The Lord of the Rings – more wicked, more tragic (Olsen 2012). The ring of invisibility, so convenient for burglars, must now hint of the menace and sleeping evil of the One Ring. So. Wicked register, tragic, menacing, evil. Dangerous, slippery, slimy, decaying. Unclean, unwholesome. Tolkien used a thicker density of sounds, particularly hissing esses and Gollum’s just-a-bit-off sibilant speech, to create corrupt register. Our noses twitch with instinctive disgust. With our new tools, we see at the word level what other scholars assert at the plot, character, and concept level. I suggest one more step back to an even wider view. We are reading Bilbo’s memoirs. In the 1937 edition, winning the riddle game was the high point of the uncommon words, the sound words, the danger, the excitement of the chapter. Bilbo’s writing thereafter is less intense, matching less-intense memories. In 1951, once leaving the sanctity of the riddle game, the danger increased and Bilbo, charged with the memory of adrenaline and excitement, wrote more vividly of the sounds which twanged his every taut nerve. I observe that Lexos was developed to find the change in the hand which held the pen – to detect when a different scribe took over the copying of a manuscript by finding the patterns in the small differences in a few key penstrokes. In the difference between the lavender sound words of 1937 and the bright purple sound words of 1951, do we detect the difference between the hand of a hobbit making up an unremarkable story which he hopes no one will press him about and the hand of an older hobbit who understands that the true tale must be told and in writing it relives the adventure in its heart-stopping fullness? Olsen, Corey. Exploring J.R.R. Tolkien’s The Hobbit. Boston: Houghton Mifflin Harcourt, 2012. Print. Olsen, Corey. Personal correspondence. July 5, 2015. email. Tolkien, J.R.R. (2012-02-15). The Lord of the Rings: One Volume (p. 249). Houghton Mifflin Harcourt. Kindle Edition. 1951: How do sound words contribute? Got them spotted? OK. I’m going to take out the pale red 1937 line and put in the 1951 purple sound line. Ready? Great elephants! 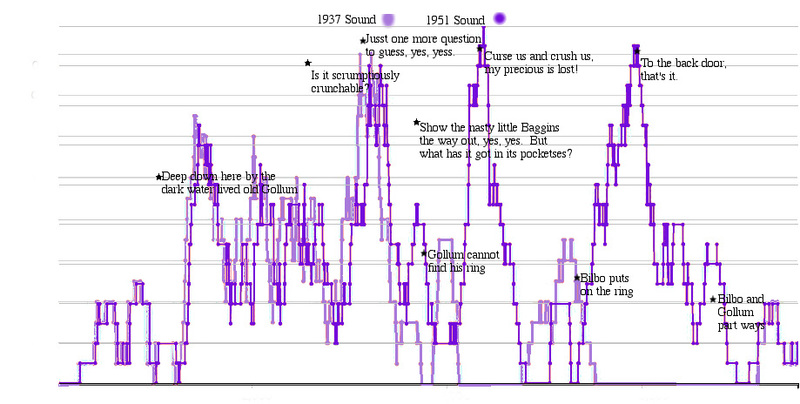 In 1937, the sound words dropped to about a third of the Riddle-Game-climax peak for the remainder of the chapter. Not so in 1951! The sound words are not just frequent, they’re punching higher in frequency than they did before, and we see from the shapes of the graphs that the sound words drive the frequency of uncommon words. These sections – approximately paragraphs [05.080] to [05.132] – are the ones Tolkien added to tie this text forward to The Lord of the Rings as he was writing and discovering that longer, more complex work. We’ve already listed the words which appeared in the 1951-only paragraphs but not the 1937-only paragraphs and vice versa; that would measure whether the new paragraphs were formed out of the words of the retiring paragraphs. There is another way to look at those unique-paragraph words, of course – to compare the new paragraphs of 1951 to the entire 1937 chapter. I’m pleased to report that list is almost the same as the previous. Almost all of the new words, naturally, occur from paragraph 80 to 132. Here they are – the completely new uncommon words from 1951.
footnote: The scales are the same as last post’s graph lines – the red uncommon words line is on the 0.00 to 0.16 scale as shown and the purple sound line is on 0.00 to 0.09. 1937: How do sound words contribute? We know that there are plenty of sound words in Chapter 5. How much do they contribute to the uncommon words of 1937? That correspondence looks quite strong – and let me give you more grist for the mill. Lexos draws each individual graph at a scale that visually fills up the space for us to see the patterns clearly, it recalculates what the scale should be for every new graph. As I reminded us in the last post, in looking at the whole book, Lexos draws the purple sound graph at about 33% of the red uncommon graph: where the two lines match, for every 100 red uncommon words, 33 of them are purple sound words. When we look only at Chapter 5, Lexos draws the purple sound graph at 56%: where the two lines match, for every 100 red uncommon words, 56 of them are purple sound words. The strength of the sound words’ contribution to our red graph is almost doubled. [05.007] ‘Go back? ‘ he thought. ‘No good at all! Go sideways? Impossible! Go forward? Only thing to do! On we go!’ So up he got, and trotted along with his little sword held in front of him and one hand feeling the wall, and his heart all of a patter and a pitter. We can also notice that the “scrumptiously crunchable” peak is not particularly driven by sound words. That may or may not be of particular interest, but it does reassure us that the strength of the sound graph elsewhere is not an error, as we can see that it’s not omnipresent. 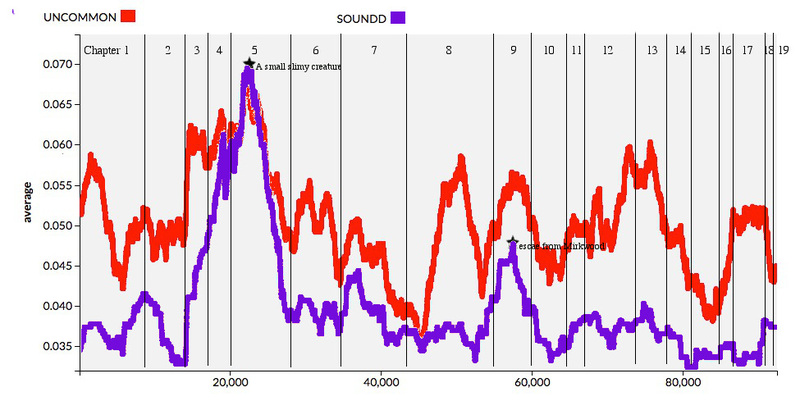 After the peak at the climax of the riddle game, we observe that the sound words recede to about a third of that peak. Footnote: I have debated erasing those y-axis scales on the left hand side completely, yet I feel an obligation to make my Lexos graphs comparable to those produced by other scholars. The scale on the sound words, which I described above as “56%” is from 0.0 to 0.09. If you need to articulate those number sentences more clearly, “for every hundred words, 16 are uncommon, of which 9 are sound words”. I don’t have the skills to read the OpenSource code which the Lexos programmers wrote, but I used to be a statistician in the days of punch cards and carrier pigeons. If you ask me questions about the numbers, I can probably ask Tech Support to read the code and tell me the details so I can make a coherent explanation. 1937 & 1951: Do the uncommon words differ? 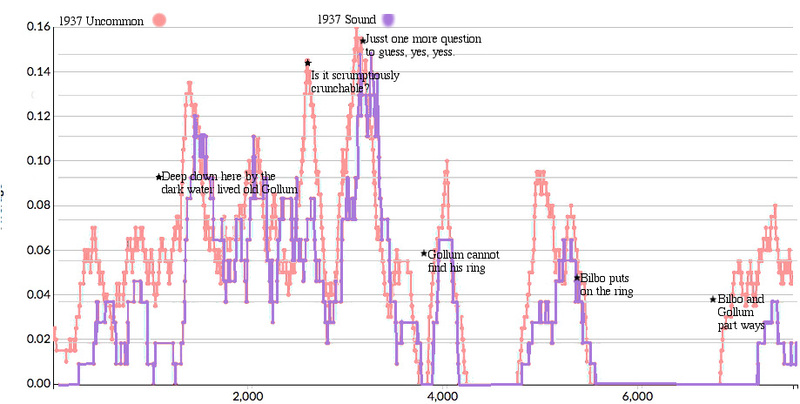 What was Tolkien doing with all those sound words – clearly the purple Sound Word graph drives the red Uncommon Words graph. We do remember that the purple line is on a 1/3 scale: when the purple and red lines match, the number of sound words is about 1/3 of the total number of uncommon words at that point. 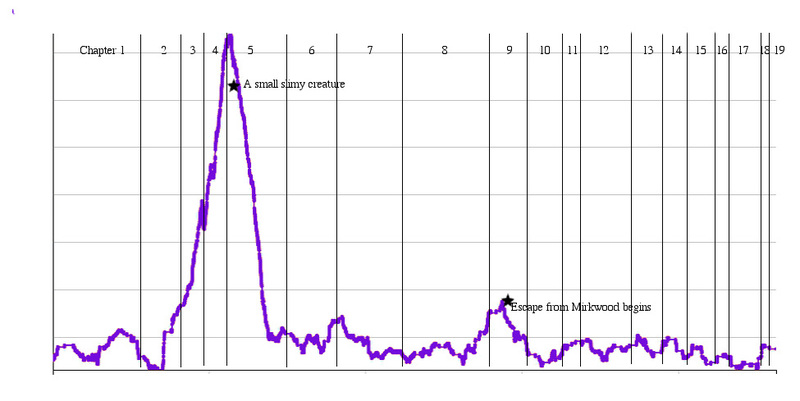 Although they’re not identical, the coincidence of the peaks at “a small slimy creature” and the similarity of the shapes of those peaks is suggestive. We may assume that a reader is following the story and the characters and may sometimes fail to notice the unusual words, phrases, or even passages. We come out into the sunlight at the end of Chapter 5 breathing a huge sigh of relief… when we were safe at home in our comfortable reading chairs the whole time. How did he use the words, phrases, and passages to effect us emotionally – subliminally? Well then, let’s take advantage of the writing and publication history of The Hobbit and take a close look at Chapter 5, the chapter which we know he changed in order to change the facts and the feeling of the story. 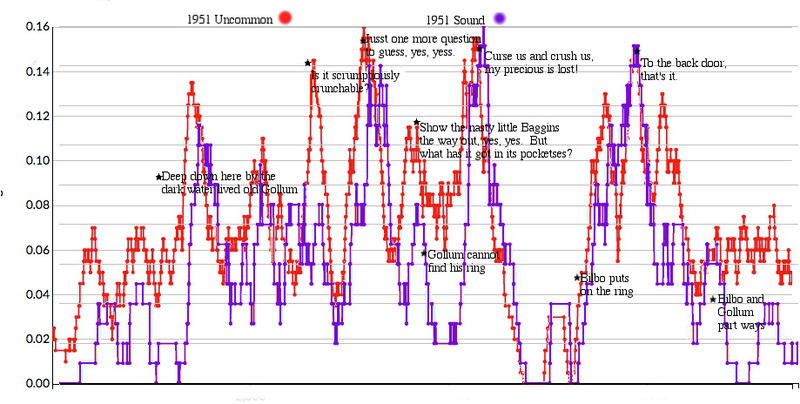 Here is the graph of uncommon words of Chapter 5 as it was written in 1937. For this much smaller sample, I used a rolling average on windows of 200 words. 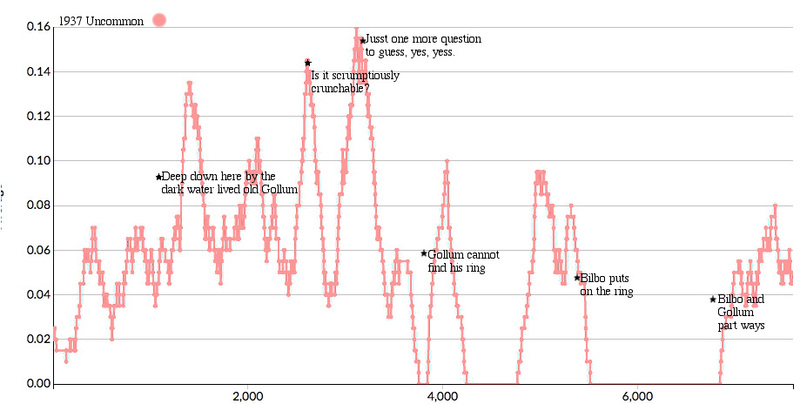 I’ve placed a few textual landmarks – I love that “scrumptiously crunchable” is one peak and that the highest frequency is right at the end of the riddle game as Gollum is waiting for Bilbo’s last question. You can see an artificial valley right as Gollum cannot find the ring, another one from about word 4250 to word 4900, and the largest and last one after Bilbo puts on the ring which stretches until he and Gollum part ways. I call these “artificial valleys” because at these points the 1951 Chapter 5 has different paragraphs and I inserted the word “and” in each spot enough times to match those 1951 paragraphs’ word count without making a false image of uncommon words. We’ve looked at which words are new in the 1951 edition (and which were lost from the 1937); are those words evenly distributed through the chapter? 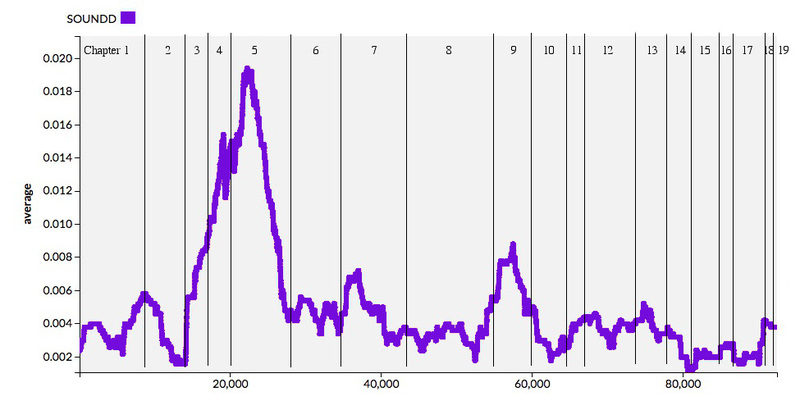 Keep your eyes on those artificial valleys as I show you the 1951 graph overlaid on this 1937. Look at those valleys! Over all three 1937 valleys are towering 1951 mountains of uncommon words! When he wrote those extra paragraphs, Tolkien pulled out the stops. “Pocketses” and “Curse us and crush us!” In the “curse us and crush us” spot in 1937, Gollum repeats “bless us and splash us”! What effect did Tolkien accomplish and how did he do it? I’m going there in the next blog post. You can even see the small artificial valleys in the bright red line where I inserted “and” in the 1951 to make up the word count from the extra 1937 paragraphs. Those 1937 paragraphs which were removed were definitely not peak word moments, they toddled along in a manner that looks pretty average for the rest of the chapter. Notice that the graphs remain the same shape but become disjoined during the riddle game? That follows a few spots where 1951 adds just a few words in just a few sentences, pushing that bright red 1951 line slightly rightward. Here’s your own Paragraph Comparisons 37 – 51 as both a graphic and a text table in PDF form. I will link a copy on the About page as well. You will need the paragraph index from the About page to follow the text rather than just get the gist of the comparison.